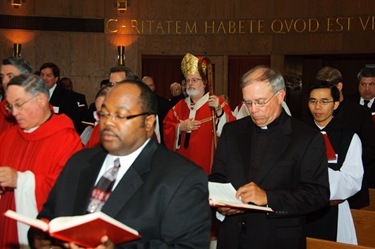 Two weeks ago, we presented the new book by Denver’s Archbishop Charles Chaput “Render unto Caesar,” which discusses the obligations of Catholic citizenship in America. 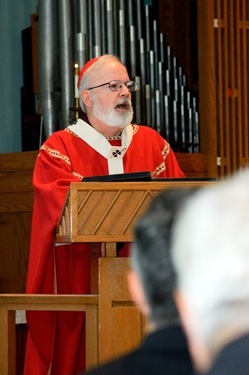 We can see this week that “Caesar” has been meeting in Denver for the Democratic Convention and Archbishop Chaput has continued to expound on the importance of Catholics being consistent in their defense of Life. The bishops cannot endorse any particular party, but we must be clear on what the teachings of the Church are and the values that must be a part of any program for the improvement of our society. It was very unfortunate Speaker Pelosi was misinterpreting what Catholic teaching is on abortion. From the very first generation of Christians, abortion has always been considered a very serious sin and a violation of human life. 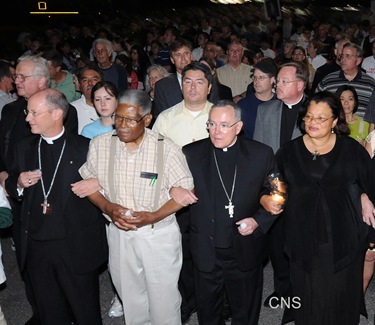 I see that the Bishops’ Conference has issued a statement on its Web site www.usccb.org. 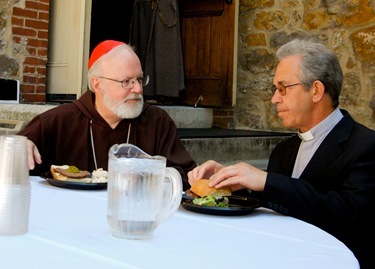 The response was written by the Archbishop of Philadelphia, Cardinal Justin Rigali, who is the chairman of our Pro-Life Committee and who, like Archbishop Chaput, is an eloquent defender of life. My main focus this week has been on the opening of the two seminaries, St. John’s in Brighton and Blessed John XXIII in Weston. 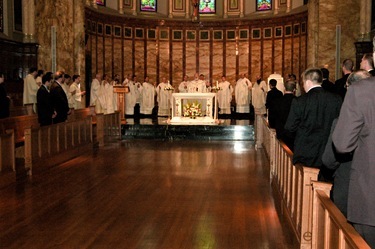 Wednesday, on the Feast of St. Monica, I celebrated the opening Mass at St. John’s Seminary. 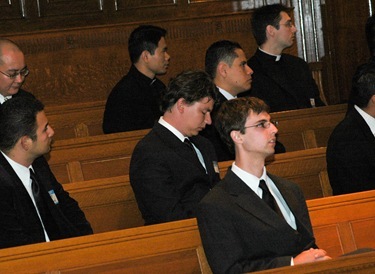 It was a wonderful occasion to see the chapel so full of young men, many of them beginning their seminary training now. In the last couple of years, the enrollment at St. John’s has risen to almost 90 students this year, up from 30 a few years ago. It is a great sign of hope for us. 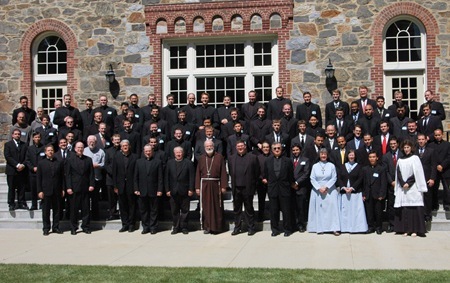 We are very grateful to the rector, Father Art Kennedy, and the faculty and the staff for their dedication to the formation of our future priests. 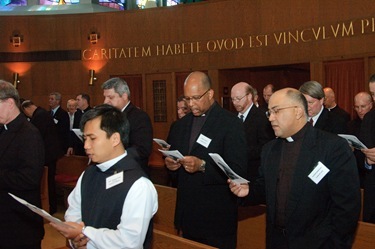 Our neighboring dioceses are sending more men and our own recruiting efforts have been blessed. 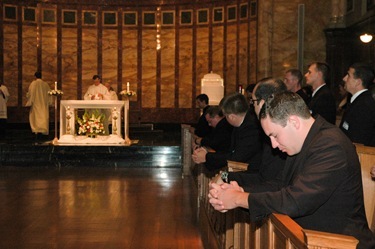 We are so grateful to the Vocations Office for their wonderful work. 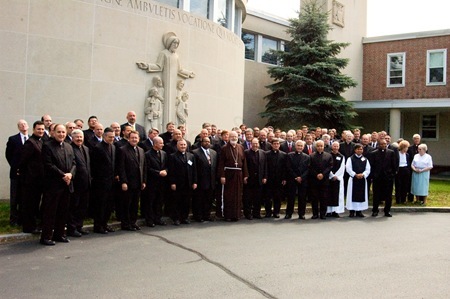 Before the Mass, I met with the faculty to share our vision for the seminary and to hear their comments and suggestions as we move forward. 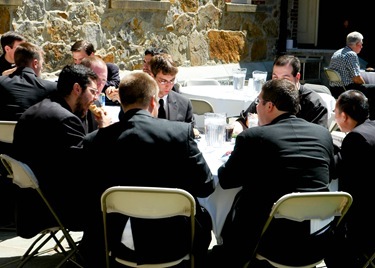 After the Mass we had a cookout and it was a beautiful day. This week the weather in Boston has been gorgeous. It has been cool and sunny and low humidity, not at all what we ordinarily expect for August in Boston. 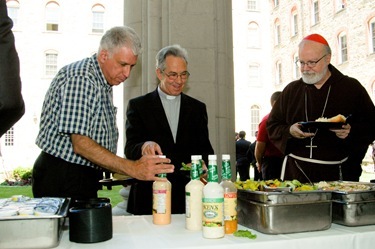 Joining us at the cookout was Bishop Gilberto Reis, the bishop of Setubal, Portugal who had come to visit me. He was in Fall River on Sunday for the huge Portuguese celebration in honor of the Holy Ghost that sometimes draws 30,000 to 40,000 people for the procession and it is one of the largest in the state. Every year, they invite a bishop from Portugal to come and preach and was the invited guest this year. 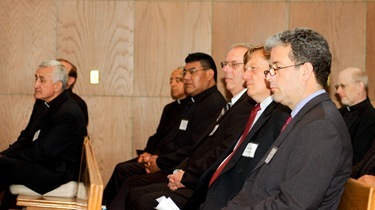 Father Jack Oliveira, the pastor of Our Lady of Mount Carmel in New Bedford, an alumnus of St. John’s was also there with us. 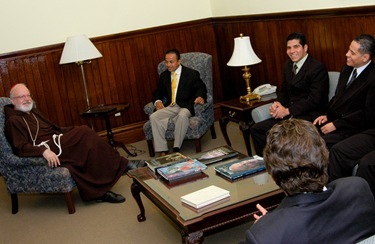 Father Oliveira brought the bishop up and was taking him around to show him Boston. 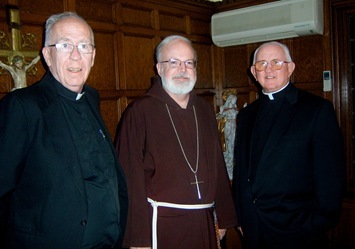 After the cookout, they went over to St. Anthony’s in Cambridge to visit Father Ferreira, who had been in the seminary with Father Oliveira. I first met Bishop Gilberto when he was an auxiliary bishop 10 years ago, when I preached a retreat for all the Portuguese bishops at Fatima. 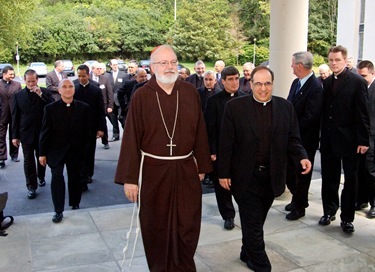 That was a wonderful experience and opportunity to get know the Portuguese bishops very well. It was very pleased by his visit. 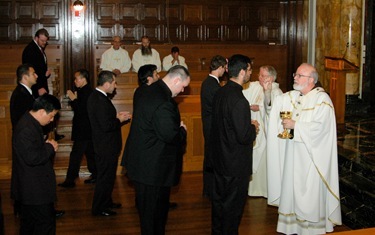 Friday morning, I drove out to Weston to celebrate the opening Mass at our Blessed John XXIII Seminary, which is for men who discern their vocation later in life. The rector, Father Peter Uglietto, was gracious in his welcome and I was very happy to spend time with the faculty and the students afterwards. 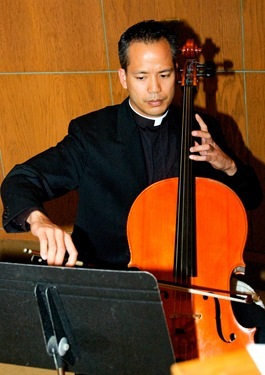 The singing by the schola of seminarians really was wonderful, especially when they were accompanied by seminarian Rendell Torres on the cello. Thursday afternoon, Mother Gertrude, the superior of the Little Sisters of the Poor in the archdiocese visited us. Their mission is a very important one, like the Carmelite Sisters and the Sisters of Charity. They brought me some wonderful home-made cookies you can see here on the coffee table. On Thursday evening I had a visit from Bishop Mauro Muldoon, the bishop of Juticalpa, Honduras and Father Richard Donahue, a Boston Priest on loan to assist with the development of Catholic Schools in Honduras. Bishop Muldoon is an Irish “infiltrator” in an Italian Franciscan province, like I have been an Irish “infiltrator” in a German province. The bishop, whom they call Bishop Mauro, is a native of St. Ann’ Parish in Neponset and has been a bishop for 25 years, and has spent almost 40 years in Honduras. He was in Boston to visit his family and to speak at Masses and other places to make appeals for the missions. He is now about to start a Catholic hospital in his diocese. The bishop and I are old friends, going back 25 years, because we both used to come up to Boston to preside over Confirmations here. 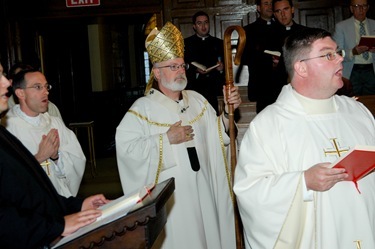 Accompanying Bishop Muldoon was Father Donahue, the director of education for his diocese. 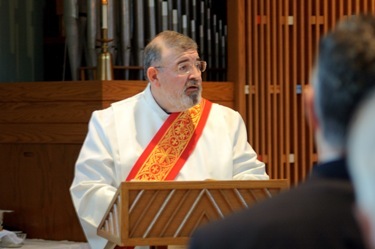 Father Donahue is originally from Blessed Sacrament Parish in Jamaica Plain. Father Donahue is a missionary priest of the archdiocese on “lend/lease” from Boston for the last 15 years. 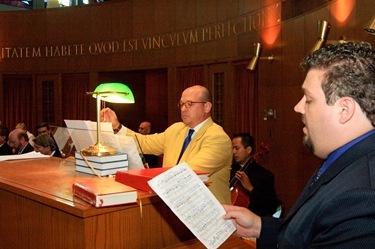 As the education director there, Father Donahue has opened many schools, including a high school, a grade school, a Catholic university of the diocese, as well as a school for special needs children, La Escuela Nazaret, founded in 1994. Father Donahue founded the school for children falling between the cracks. More than two dozen of the students have Down Syndrome, are deaf or physically disabled. Some will return to their previous schools after spending time at this school or stay for the vocational training, which allows them to live self-sufficient lives. The university is located just outside Juticalpa, the capital of Olancho. It is on 14 acres of fairly level land. The university has 200 students and two dozen faculty members. Its academics have a heavy emphasis on business, law and marketing with programs that allow the students to work internships in their field. 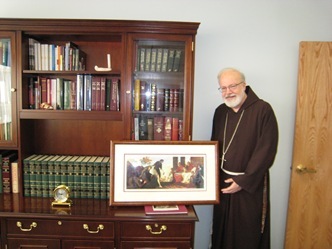 Finally, my brother Capuchins recently presented me with some gifts I’d like to share with you with week. The friars from Capuchin College in Washington presented me with a copy of a famous painting by the Venetian Sebastiano Ricci, which represents The Lady Poverty presenting the Capuchins to Pope Paul III. Ricci apparently did many paintings of Paul III and this painting was made at a time when the Capuchins were just getting started. It is a very striking painting. Lady Poverty is sort of a towering figure there, who is an allegorical representation of St. Francis’ love of Gospel poverty. This was a painting from that period in the 1500s of the Capuchin reforms and you can see the Capuchins with the robes and the long beards. After we left World Youth Day in Sydney, I took the opportunity to visit the Capuchin mission in Papua New Guinea, where three of my classmates have been stationed for 40 years. 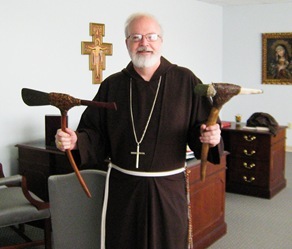 To commemorate my visit they presented me with these axes that are like tomahawks made by the natives there for hunting. I haven’t used them yet, but I was thinking of bringing them to some of my more difficult meetings — to use as a gavel! Enjoy this Labor Day weekend and what’s left of our summer.